Yes, there are wingnuts who want to go after Rod Rosenstein. But shouldn’t the media pay more attention to GOP critics of Trump’s high crimes and misdemeanors? Talk about impeaching President Trump is the wild-eyed expression of the most militantly anti-Trump Democrats, right? Most media coverage of Republicans and impeachment has focused on “Freedom Caucus” blathering about impeaching Deputy Attorney General Rod Rosenstein for respecting the rule of law in a moment of mounting lawlessness. But that wingnut project is already being abandoned by the wingnuts. A far better measure of the troubles facing the Trump administration is coming from more-responsible Republicans—elected officials and former elected officials—who have begun to discuss the prospect that this president will face an accountability moment. Some are even suggesting that it is time to remove the man who has disregarded not just the Constitution but the basic premises of a party that once accepted its duty to check and balance even its own presidents. But the president might go there. And even if he does not, he has certainly gone in the direction of other impeachable offenses. That has not caused House Republicans to abandon their obsequious Trumpism. But, outside of Washington, Republicans are starting to recognize that this presidency has gone horribly awry. “Our president has mocked and belittled our immigration laws, our intelligence agencies, our foreign policy strategy and even the American people. We have been called ‘stupid,’ ‘weak,’ ‘a joke’ and ‘pathetic,’ all by our own president,” wrote the Republican representative whose criticisms of Trump over the past several years undoubtedly played a role in his Republican primary defeat earlier this year. Villalba is an outlier among Republicans. But he is not alone. 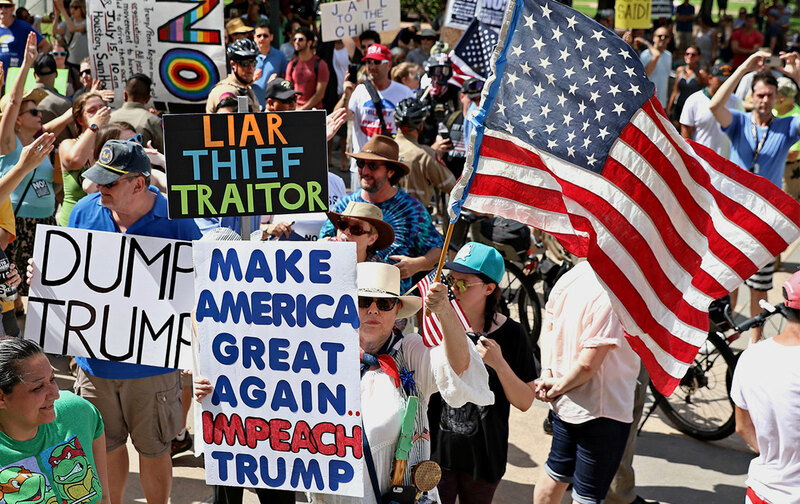 An April PBS NewsHour/NPR/Marist poll found that 10 percent of Republicans nationwide would vote for a candidate who supports impeachment (as would 70 percent of Democrats). At the same time, the veteran Republican, who served as Environmental Protection Agency administrator under President George W. Bush, outlined steps that Republicans should be taking to hold the president to account.